During a press conference held on January 19, Tetsuya Komuro announced that he is retiring from the music industry. The press conference was held in Tokyo in a plain room for reporters to gather in. Komuro arrived 7 minutes late with his head held low as he sat at a desk in front of the room. 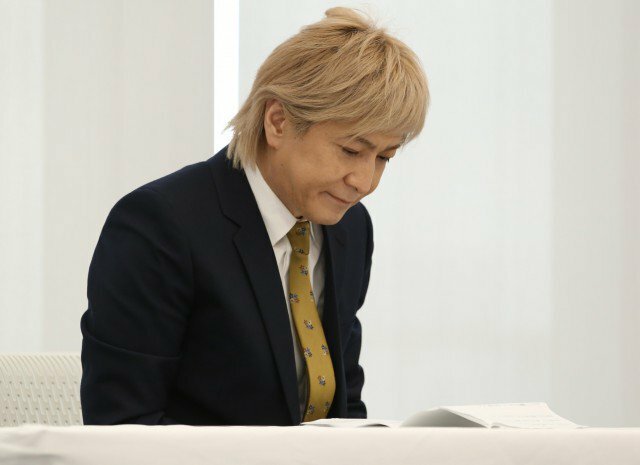 "I apologize for worrying my wife KEIKO, my family, my fans, and my staff due to the news reports that have come out," Komuro said before ultimately announcing his decision to retire. Despite his decision, Komuro did not admit that he had committed the alleged affair. Instead, he characterized his decision as a way to atone for creating a disturbance. Earlier this week, a report published by Shukan Bunshun alleged that Komuro has been cheating on his wife. According to the magazine, Komuro was seen spending the night at a woman&apos;s house in mid-December. The two were seen staying at the same luxury hotel in early January, and Komuro spent the night at the woman&apos;s house during the same time period. Komuro has denied that he has been having an affair. Tetsuya Komuro was one of Japan&apos;s most influential musicians and is noted for his prominent work as a producer. He and KEIKO were members of the popular 90s group globe. The two married each other in 2002.
wow, this is big news. there goes Japan&apos;s most legendary producer/songwriter in history. I appreciate his humility.